A boy uses wooden sticks for ski poles in Malam Jabba, Pakistan. Pakistans scenic Swat Valley, a former Taliban stronghold, hosts the countrys only ski resort, or what is left ot it. 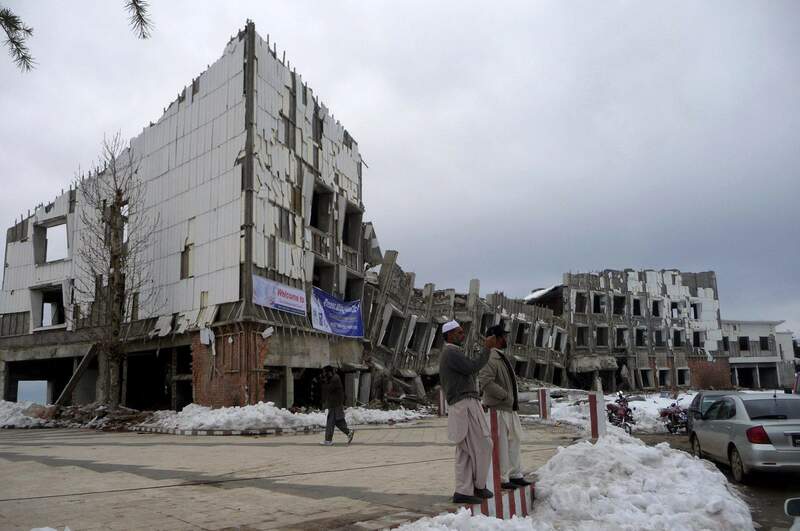 Much of the resort in Malam Jabba, Pakistan, was destroyed by Taliban forces. There are efforts to revive the only public ski area in the country. MALAM JABBA, Pakistan  The chairlift and hotel were destroyed, the snow was not the greatest, and the apres-ski was tea and rice. But at least the Taliban were gone, and no shots were fired. That made for a good days skiing in the Swat Valley, the Switzerland of Pakistan until the Taliban moved in and turned the countrys only public ski resort into a training and logistics base. The military ran the insurgents out in 2009, and now I was in Malam Jabba to fulfill my dream of carving a few turns in Swat alongside a handful of local enthusiasts, some in colorful ski suits, some in traditional robes and some with sticks for ski poles. Unused to foreigners, who usually are under orders to stay out of Swat for their safety, my fellow skiers stared in disbelief as I hopped out of my truck after the seven-hour trip from Islamabad, strapped skis to my backpack and set off for the main 800-meter-long piste. They followed me to the slope. Those who could speak English goodnaturedly asking me how on earth I came to be here. It turned out they were holding a Peace Ski Gala in hopes of whipping up support for rehabilitating the resort. The skiers pushed forward a skinny man with a black beard who wore a sky-blue ski suit and white rear-entry boots. This was their best skier, they said, and insisted I ski with him. But first they wanted to be photographed with me, a puzzling request since mine was the only camera on hand. This would go on all day. Finally, we began trudging up the slope, past a slalom course marked with flags on wooden poles. The hike took only about 10 minutes since the snow was only good enough to ski the bottom half of the slope. Most of the conversation on the way up was dominated by a man in robes and a wool blanket who said he was a mathematician and begged for advice about getting a U.S. visa  a common pursuit in this poverty-stricken country. Then, from a height of nearly 9,000 feet, I was able to take in the full view of waves of mountains in the Hindu Kush and Karakoram ranges. Farther north, Pakistan has some of the worlds tallest peaks, including K-2, but is too poor to have much skiing infrastructure. The only areas with ski lifts are controlled by the military for training. The Wali of Swat, who ruled the area until the 1960s, used to move his court to Malam Jabba during the summer, tourism officials told me. It may have been during one of these trips that his good friend, the Austrian ambassador, proposed a ski resort. The Austrian government funded the chairlift and provided skis and boots, while the Pakistani government built a hotel with 50 rooms. Construction finished in 1988, but the resort sat idle for another 10 years because of disputes over whether it should be run by the government or the private sector. Now the hotel stands in ruins. The chairlift was destroyed by the militants, and its metal scavenged for sale as scrap. All that remains of the resort is a row of a dozen metal shacks that offer tea and rice. After my first run down the piste, as I was preparing to hike up for another, a couple of chairs were set up on the snow, and I was offered tea with Matiullah Khan, a Pakistani ski hero of Bode Miller proportions for having represented his country at the 1996 Asian Winter Games in Harbin, China. Khan, now 47, is a former air force officer with a bushy gray beard who wore a lavender ski suit. 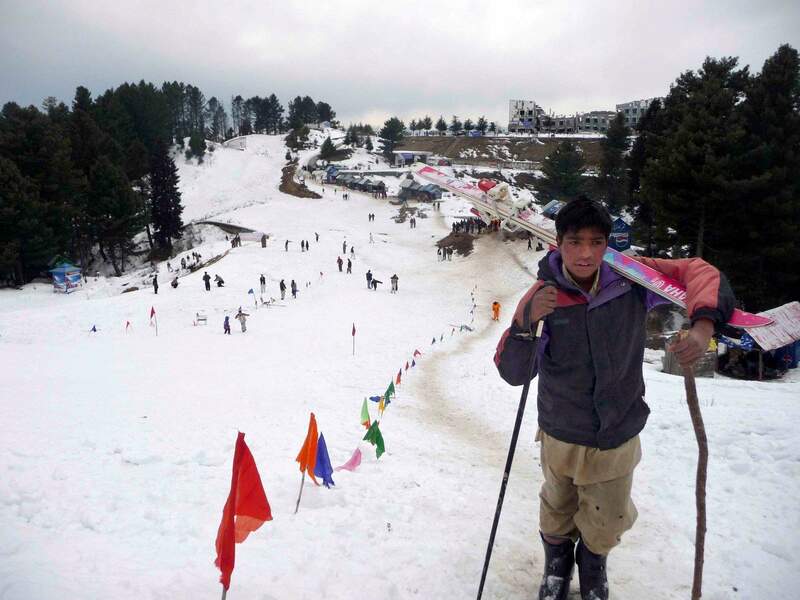 He runs the Malam Jabba ski school and helped organize the Peace Ski Gala. He said he hoped the government would rebuild the resort. But the tourism officials said that would cost $4 million, and the government has more urgent priorities rebuilding what was destroyed in the fighting and the floods last summer that washed away houses, roads and bridges. As I hurried uphill for a final run before it got too dark to drive home, I felt a tap on my shoulder. Someone was behind me carrying a white cup. I had forgotten to drink my tea.